A day in the life...: Lola is crawling! This video is hilarious! She will crawl just enough to get within reach of desired object, then sprawl out and reach. She is still really lazy but at least she can crawl... finally, right? 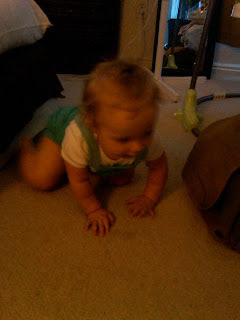 ha ha She is getting better at crawling everyday! YAY LOLA!!! Way to crawl around in style...I hear those diaper-hats are a big item this summer! I love that she performs for treats...a girl of my own taste. That video is so adorable!! Har har. She's my fave. She is getting SO big and SO cute! so cute & grown up. i LOVE that stage. lola=a doll.